DONATE...You can enjoy DRUMline for free. In order to keep the site free we are accepting donations. If you like the site and are so inclined, donations help us do a better job and improve the site. Thank you. DRUMline is an interactive blog. I want us to communicate, share ideas, learn, play and surprise the heck out of each other. Much of my personal growth and joy throughout my lifetime has involved the drums. I am searching for more personal growth and joy, hopefully you are too! It will take a little time to coordinate the technology since we are relatively new. Our goal, however, is to involve the drumming community and connect it via the internet. The more communication the better. We will have famous drummers featured but also a lot of great drummers you have never heard of, maybe even you. I ask for your patience and participation as we refine this experiment. Over time, the opportunity for exposure will increase and you can help me broaden our scope. Interactive - Some cool things you can do on the site, 1- you can watch videos. 2 - you can let the music play while reading, just click play and scroll down 3 - you will see related videos come up after the ones I have selected so you can dig a little deeper 4- Click in and out of a particular BLOG to reset videos to defalut selection. 5- Slide Shows - Let 'em play or use controls to view. 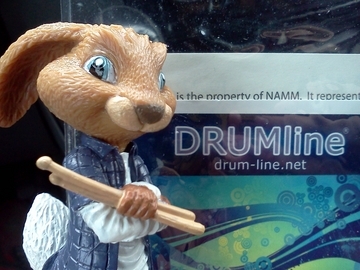 DRUMblog- email me if you want me to BLOG your news, mike@drum-line.net. .....or use the Contact form below! DRUMblog - I will be blogging news and updates. If you have something you wish me to blog about use the contact form below on this page (i.e. tour announcement, clinic, new music, etc.) I will include as much info as I can. Jason Achiles Mezilis, the best Greek musician since Rocrates, informed me that OWL has recorded new music and is currently mixing it. OWL (Chris Wyse - bass, Jason - guitar, Dan Dinsmore - drums) also had John Tempesta (who plays with Chris in The Cult) guest on a track. The band is also editing their first video from the new album. OWL's originality is amazing and their hook ladened powerage is soon to grab your attention. It is, however, in Dutch...but not the drum parts, that's universal!